At 23rd on the AFI�s list of the top 100 films, 1941�s The Maltese Falcon ranks as its second-highest rated film noir after 1974�s Chinatown at #19. Actually, the AFI chart includes only a few flicks in that genre, so Falcon doesn�t have much competition there. I checked out the DVD of Falcon simply to review it for our AFI 100 page. I first saw Falcon back in college, and it didn�t do much for me at all. I don�t know what my problem was back then, because on second viewing, I realized how off base I was. Contrary to my teenaged opinion, Falcon provides a rather tight and intriguing mystery drama. The film starts with a text introduction to a priceless object called the Maltese Falcon. We learn that it went missing many years ago, but clearly many folks still crave that ultra-valuable token. We then jump to contemporary San Francisco and meet a private detective named Sam Spade (Humphrey Bogart). A client named Miss Wonderly (Mary Astor) entreats Spade to find her sister Corinne. She allegedly has become involved with a shady character named Floyd Thursby. Spade�s partner Miles Archer (Jerome Cowan) takes a shine to Miss Wonderly, and he agrees to tail Thursby and talk some sense into him. Unfortunately, this doesn�t work out well for either part. While on the case, someone shoots Archer, and Thursby turns up dead as well. Various authorities and others accuse Spade, so he works to get to the bottom of the events. Wonderly confesses that her real name is Brigid O�Shaughnessy and she slowly reveals the truth behind the matter, but she deliberately takes her time in that regard. Spade and Brigid seem to fall for each other, but the story revolves around the pursuit of the Falcon. Brigid indicates she knows where it is, and others � primarily Joel Cairo (Peter Lorre) and Kasper Gutman (Sydney Greenstreet) � enter the attempts to land the object as well. The tale involves the whole batch of them as the truth slowly unfolds. A rather cynical film, Falcon�s hard-bitten tone comes naturally and doesn�t feel like coldness just for its own sake. Spade seems distinctly rough and bitter, though in an interesting twist, he�s the only one who displays any genuine emotion during the film. He clearly falls hard for Brigid, who may or may not return his affections. She remains a distinctly slippery character throughout the movie. Does she care for Sam or does she simply use him for her own gain? We never really get a hold on that, though I lean toward the latter interpretation. It seems like most of the conflicts that occur in Falcon occur due to her machinations, and she doesn�t really seem to care about anyone but herself. Granted, the males also come across as quite self-concerned and mercenary, but at least they appear upfront about it; it�s Brigid�s deceit and dishonesty that makes her the film�s most treacherous character. Brigid is also probably the weakest link in regard to its actors. Astor does a decent job in the part but she feels somewhat drab at times, which makes it somewhat hard to see why Spade becomes so nuts about her. She�s not that attractive, and she lacks a lot of personality to allow her to appear more enticing. The various male actors do much better. Bogart grounds the piece nicely and seems appropriately tough and convincing. Lorre appears typically sniveling and shady, while Greenstreet makes Gutman a surprisingly engaging character. �The Fat Man� features a bounce and lightness that offer an interesting twist on a role that could have been little more than a typical movie heavy. However, when necessary, Greenstreet lends the part the genuine malice at times. It�s a great turn among many fine portrayals. A taut and vivid mystery, The Maltese Falcon holds up very well after all these decades. The story seems absorbing and captivating, and director John Huston tells it in a nicely succinct and crisp manner. A genuine classic, film noir fans should simply adore this flick. 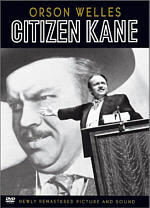 Insult to injury footnote: it�s bad enough that the sentimental How Green Was My Valley beat Citizen Kane for Best Picture from 1941. The fact that Valley also topped the wonderful Falcon makes matters worse. 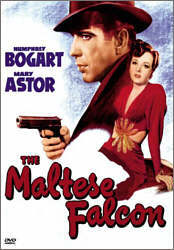 The Maltese Falcon appears in an aspect ratio of 1.33:1 on this single-sided, double-layered DVD; due to those dimensions, the image has not been enhanced for 16X9 televisions. Overall, the picture looked decent for its age, but it presented too many issues to rise above a level of general mediocrity. For the most part, sharpness seemed quite good. During much of the movie, it looked nicely crisp and well defined. Only a few occasional examples of softness presented themselves during this otherwise clearly delineated and accurate image. Some light moir� effects occurred via elements such as wrinkles in foreheads � and I also noticed minor instances of jagged edges at times. Black levels usually appeared deep and rich. At times, however, the image became somewhat muddy. Those instances mostly happened in nighttime exterior shots, which could seem a bit murky. Otherwise, contrast looked reasonably accurate, and shadow detail was appropriately heavy but not overly dense. Where Falcon lost most of its points related to its print flaws. Unfortunately, the DVD offered a fairly dirty presentation. The image occasionally seemed jumpy and wobbly, and it displayed many different forms of defects. I noticed quite a few examples of specks, grit, streaks, grain, tears, blotches, and hairs. Scratches also showed up in bunches. While the amount of flaws didn�t seem overwhelming, the movie definitely needs a good cleaning, and I feel fairly certain that The Maltese Falcon could look much better than it did on this DVD. As for the monaural soundtrack of The Maltese Falcon, it appeared pretty good given the age of the material. Speech generally came across as reasonably concise and distinct. I noticed a little edginess at times, but I experienced no issues related to intelligibility. Music appeared decently bright and clear, and effects also came across as clean and accurate. I discerned no significant problems related to distortion in those domains, and the mix also lacked noticeable background noise. Ultimately, you won�t use The Maltese Falcon to show off your sound system, but the audio seemed somewhat above average for a flick of this vintage. The DVD release of The Maltese Falcon contributes a mix of supplements. Becoming Attractions: The Trailers of Humphrey Bogart offers one of the oddest documentaries I�ve seen. 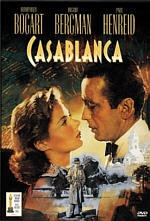 Hosted by Robert Osborne, this 44-minute and 40-second program indeed showcases the ads used to promote Bogart�s flicks. Created for the Turner Classic Movies channel in 1997, the show features promos for 12 Bogart efforts. Of course, Falcon appears in there, and we also find trailers for famous efforts like Casablanca and The Treasure of the Sierra Madre. Osborne offers some useful historical notes for this unusual but entertaining program. In addition, the trailer for Falcon appears elsewhere on its own, along with an ad for Satan Met a Lady. A starring effort for noted fish and chips entrepreneur Arthur Treacher, this promo shows up because the film in question told the same tale as Falcon but hit screens five years prior to the Bogart classic. Finally, a couple of text extras appear. In the Cast and Crew area, we find a biography for Bogart. The area lists other participants, but only Bogart receives the descriptive treatment. A History of Mystery provides a decent overview of the genre�s origins and more famous works. Despite my teenage dislike of the film, as an adult I found The Maltese Falcon to provide a tight and intriguing story. The movie told its tale in a vibrant and concise manner and seemed to deserve its reputation as a classic. The DVD presented picture and sound that appeared fairly mediocre for the film�s age, and the disc included an unusual but interesting extra that examined trailers of the era. While not very strong as a DVD, The Maltese Falcon offered a solid enough disc to merit your attention given the high quality of the flick itself.